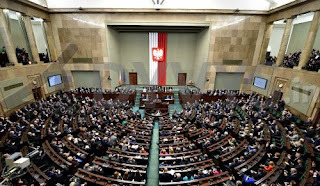 The Polish Senate has passed a controversial judicial reform bill despite growing criticism at home and abroad.The bill proposed by the populist ruling party only needs the signature of President Andrzej Duda to become binding.The bill's passage late on Friday was met with boos from protesters gathered in front of the Senate building. EU leaders say the bill would kill judicial independence and threaten the rule of law in the EU's largest member in central and eastern Europe. Jaroslaw Kaczynski, head of Poland's ruling Law and Justice party, contends the judiciary still works along a communist-era model and harbours many judges from that time. Communist rule ended in 1989. He says the justice system needs "radical changes" to become efficient and reliable. Prime Minister Beata Szydlo says the legislation is an internal matter and the government will not bow to foreign pressure. In anticipation of the vote, crowds gathered on Friday night for yet another protest in front of the Supreme Court building in Warsaw and other cities. About 200 protesters also gathered in front of Duda's holiday house in Jurata, on the Baltic coast, to demand he does not sign the bill. The president has 21 days to sign it, and is not expected to do it before his meeting on Monday with the head of the court, Malgorzata Gersdorf.